As summer turns to fall, gardeners turn to chrysanthemums for continuing garden color. A reliable, easy-to-grow perennial, the chrysanthemum (or “mum” as it is often called) blooms right on through the frosty weather and sometimes even into the coldness of December. 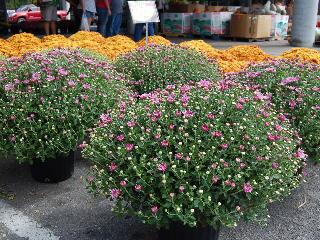 Mums are available in a wide array of color choices including white, pink, red, yellow, and some shades of orange and lavender or purple. Most of the plants, if properly cultivated, provide almost a solid mass of blooms across the surface of the plants, yielding a brilliant display whether grown outdoors in the flower garden or in containers on the patio or deck or in window boxes, or grown indoors as houseplants. The blooms may also be cut and arranged into a colorful tabletop bouquet, mixing the colors together or creating a mix of mum blossoms and other types of flowers and greenery. The easiest way to procure healthy, heavy-laden-with-bloom-buds chrysanthemums is to purchase them at your local garden center when they are in plentiful supply in the early fall. This assures you of a good selection of colors to suit your planting needs. 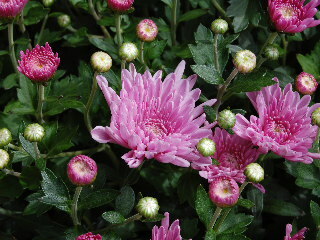 Blooming mums are also often available for spring purchase around the time of Mother’s Day. These spring bloomers can then be planted directly into your garden to spend the summer there in the great outdoors. As the blooms fade in the heat of summer, pinch back or cut back the top growth to encourage more denseness and fullness in the plant. Then, allow the full growth to develop in the late summer, thus encouraging the development of a profusion of fall blossoms. The chrysanthemum plants should be able to over-winter successfully in your outdoor garden if the weather conditions are not too severe. If you live in a colder locale, it’s best to cut your mums back to a height of just a few inches and then cover them with a good mulch to get them through the cold months. In the spring as the new growth appears, you may want to divide your plants, especially if they have been in the ground for a couple of years and have developed a lot of woody stem growth in the central part of the plants’ crowns. Dig up the plants and divide them into several pieces, making sure to have a good section of roots and top growth in each division. Use mostly the outer tender growth part of the mums to replant and not the tough woody inner part we mentioned; the newly divided sections will bloom more vigorously than the older wooded sections. Be sure to water your chrysanthemums well, particularly in the heat of summer, and don’t allow the soil around them to completely dry out, as mums tend to be rather shallow rooted plants. Mums, which are members of the daisy family, prefer a richly organic soil and do their best growing and blooming in full sun, although they will also produce blossoms, just not as many or as large, in partial shade. Healthy mums are rarely affected by diseases or insect pests other than maybe the occasional aphid or leaf borer, which can be easily handled with mild insecticides. Not only do the plants over-winter quite well and produce tons of blooms even in cool weather, they are also easy to grow and will repeat their blooming performance year after year with a minimum of effort on your part. No wonder chrysanthemums are often called “hardy” mums!